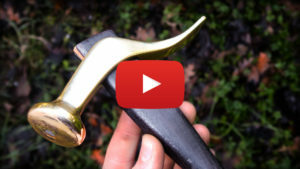 Creating a copy of an old leatherworking hammer in brass. This is a very common shape of hammer for leatherworker and shoemaker, I’ve always thought it looks super cool! unfortunately I forgot to add rafts in my model so then to make it release from the mold I had to add those by hand with wood filler and wile I was at it I also primed the whole pattern with filler primer and sanded smooth.